Here's one from the archives that it's taken me a long time to get around to processing! Seattle, only about two and a half hours drive south from Vancouver (excluding border crossing times), is another incredibly photogenic city. This shot was taken from Kerry Park, looking south-east towards the Space Needle and downtown Seattle. This is such a popular shot that you need to get there early on a fine day to get the best spot for your tripod, and there were probably at least 8 other photographers there on the night when I shot this. 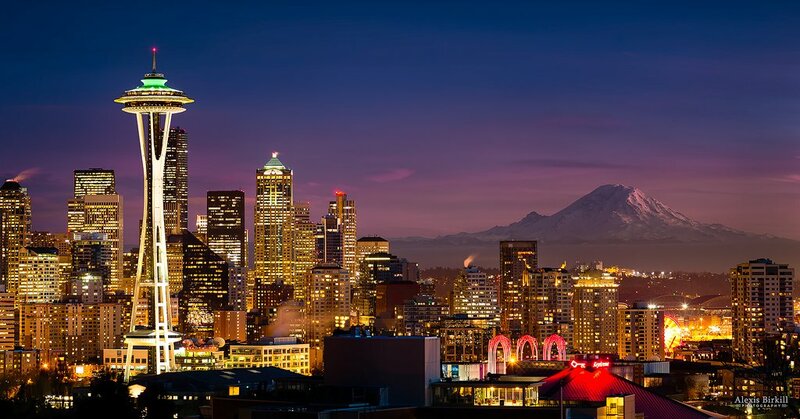 This is a beautiful view at any time, but occasionally you are lucky enough to be able to see Mount Rainier as well, about 100km away but still very prominent on the skyline. Because of the distance, a clear view of Rainier is relatively uncommon. When I arrived at this location, the mountain was visible, but didn't have the clarity I was hoping for. As time passed and the sun began to set, it looked like I wouldn't get anything too amazing of the mountain, but I was enjoying shooting the Seattle skyline. Most of the photographers began to pack up, but I waited a little longer just to see. About 15 minutes after the sun had set, a few clouds in the sky to the west began to glow with post-sunset light, and picked out the snow on the side of the mountain in a wonderful pink-orange colour. I snapped as many shots as I could in the five minutes that this lasted! just gorgeous! Not sure what is more impressive, the skyline or the mountain? Now I put Kerry Park on my list for next time I'm in Seattle. Beautiful! Love the mountain included with city shot. Very pretty. Amazingly gorgeous. I love that you got a little light on Mt. Ranier, too. I stumbled upon Kerry Park some years ago -- what a view! Ow wow Alexis this is beautiful!! Love that you can see the mountain, and so pretty with all the lights of the city! fav! Really great cityscape. Over the top with the mountain too. Fav! Just curious as to how you decided on settings for this one - particularly the aperture? Oh wow! Gorgeous. Love the composition. Wow! Outstanding photo! Composition and lighting perfection! Fav! so surreal. it looks like the mountain just floated out from behind the buildings. amazingly beautiful photograph. so that is the key, patience, patience and more patience. you always outdo yourself, alexis. great work, like always! @kph129 Good question! It was so long ago I don't exactly remember! The 24-105mm is still very respectably sharp at f/5.6, and everything in this photo is at least 1 kilometre away, so there was little need for a wider depth of field. I sometimes widen the aperture to increase the shutter speed, particularly if it's windy. My tripod was quite precarious here (I was standing on top of the wall at the edge of the park, to get the most unobstructed view), but I don't think it was particularly windy that night, so I doubt on this occasion I chose a wider aperture for that reason. Sorry I can't quite say for sure, but hopefully that gives an idea as to my general thought process in situations like this! Just beautiful! We lived in Seattle for a year...I always loved it when Mt. Rainier was visible in the distance. Love the city view with the mountain as backdrop. Well processed. Your patience paid off Alexis...this is stunning .....so great to see Seattle & we can see it in all its glory here! As usual you are giving us tips too, thank you. Big fave! Beautiful shot. Like this location a lot. Thanks! I love to know the reasoning behind masterpieces. I was guessing maybe reducing starbursts played a part. This is so beautiful. Fav! This is so beautiful! I have to take a trip to Washington. I have been to Oregon, I need to go more north. This is a fav! Wow! So glad this went to the TT. Stunning composition, Alexis. I'd fav this one thousand times if they'd let me. Congrats on TT, incredibly well deserved. Wonderful shot! My neck of the woods. :) Fav and follow! Congratulations Alexis, I am glad to see that another of your works of art made it to the Top Twenty! One of the nicest Seattle shots I have seen - and I live in WA. Stunning. This is one of the best pictures I've ever seen of Seattle. You got all the elements in there so well. From a Seattle native, this is truly stunning. Fav. A stunning night scene , has to be the biggest fav ever! Are you kidding me?! LOVE the composition. Just a superb shot. Wow!